My grandmother Gertrude received a copy of The Friendly Road for Christmas in 1919. It must have been a special gift book--green leather binding, gold embossing, a sheet of tissue paper protecting the color plate facing the title page--this a painting of a solitary man enjoying a swim in a sun dappled stream with the caption "Surely it is good to be alive at a time like this." 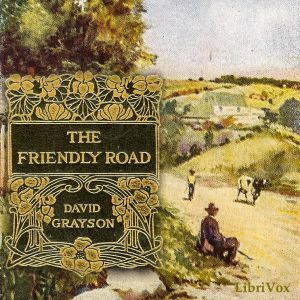 Written in first person, pseudo autobiographical style, the “author” of The Friendly Road, David Grayson, is a writer,* living on a farm with cows to milk, and ducks and pigs to feed, and fields in need of plowing. One day he just slings a few belongings in a pack and walks off, leaving the cows unmilked and his sister Harriet standing in the doorway. "My sober friendGrayson writes, "have you ever tried to do anything that the world at large considers not quite sensible, not quite sane? Try it!" The rest of the book is an odd mixture of nostalgia for a gentler, kinder age; adventures, as Grayson relies on the charity of strangers to get by; with a bit of progressive politics thrown in. After bumming for several days, Grayson arrives in the "City," where a strike is in progress. He sympathizes with the workers, but he is appalled by "the ill-smelling streets and dirty sidewalks and swarming human beings . . . the evidences of poverty, dirt, and ignorance." And guess what? He returns home to his farm, and Harriet bakes him a rhubarb pie. Gertrude entrusted several of her favorite books to my teenage self before she died in 1958. Another was a book of poems entitled Because I Love You, inscribed to Gertrude as a birthday present in 1897 by a young man who was not my grandfather! Books. . . choices . . .
*David Grayson was a pseudonym used by the actual author of The Friendly Road, Ray Stannard Baker. **Louis Adamic ,”A Man from the Black Forest," in Two Way Passage (1941).